Disqus is one of the greatest effective and beautiful comment platform that supports any website, any devices (desktop to mobile) including Google AMP, with 70 languages supported and counting. 1. Awesome design and colors (also customizable) that automatically adapted to your site. 2. From desktop to mobile works everywhere. 3. Access of powerful comment moderation (Spam, filter, reputation and many more). 4. Access to analyze the community built in your website or blog. 5. Disqus allow to make real-time discussions with up and down votes, threaded replies, recommends and many more interactions. 6. The media support (Upload images and videos on comment) is excellent to discuss lively. 7. 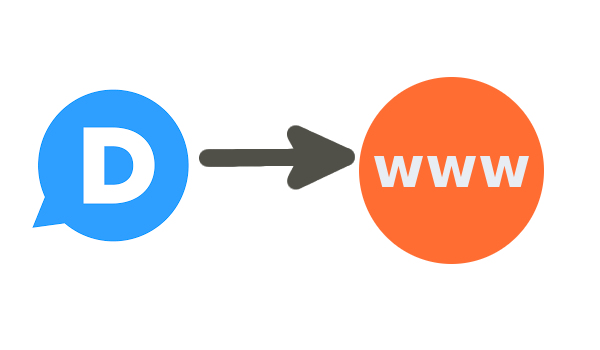 You can make revenue by advertising with Disqus on your website or blog. The advertisement and its position are flexible (You can put ads below comment, above comment and in thread), adapted to page and supports revenue analytics. You can also choose and select ad types. 9. Increasing the page view. 10. Easy to install and many more. Step-1: To install Disqus, first you have to sign up and create Disqus for your website or blog. To do that, go to Disqus.com and sign up (If you have a profile on Disqus, you need not to sign up again. Just follow the next step) and you will see a pop box to sign up with Facebook, Twitter, Google Plus and Email. I do recommend to sign up with your email. Complete sign up by email confirmation, profile editing. After doing follow the next. Step-2: Click the link and choose the second (I want to install Disqus) and you will be redirected a new page like below. 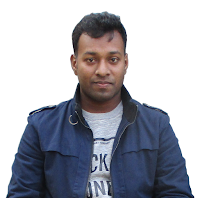 Category: Select a category of your website or blog. Next 'Create Site' and you will get a pop up box about welcome and scroll down and choose 'Got it. Let's get started'. 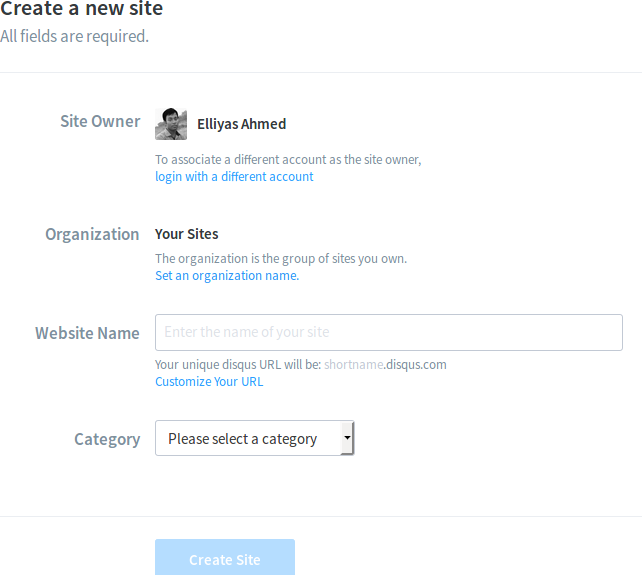 Step-4: You will get an option to select your website or blog platform (Wordpress, Blogger, Joomla, Tumblr etc). 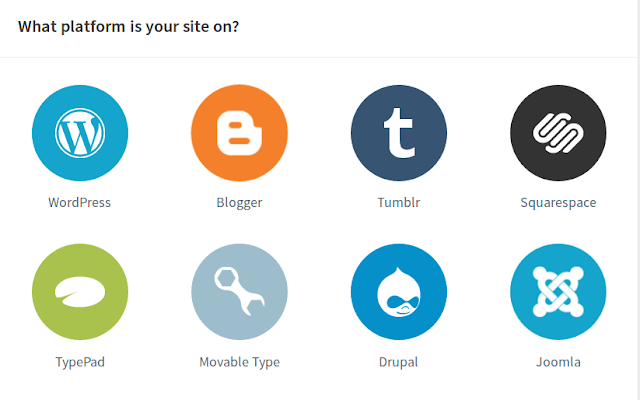 If you get your platform from the lists then select and install Disqus manually. For Blogger, choose 'Blogger' platform and you will get like below. 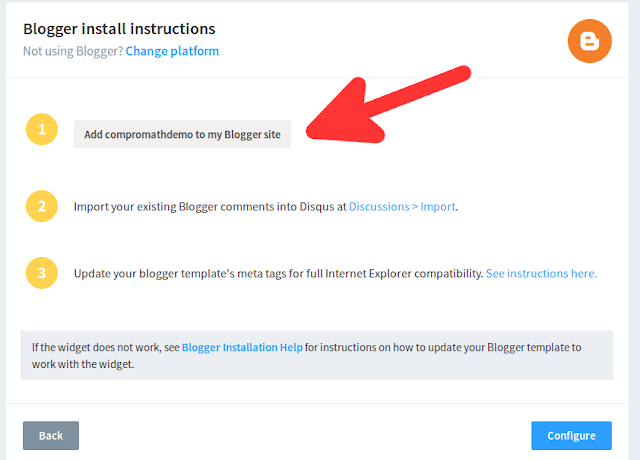 Step-5: Select your blog where to install Disqus → Add Widget and save template. Step-6: Finish. Now you will see Disqus comment section instead of Blogger comment in your each blogger post. For Wordpress and others, select your platform and follow the given instructions. If it has been troubled or if you do not find your platform to install Disqus in your website or blog, you can use universal code to install and it is simple and easy. To do it, just follow the given instructions. Recommend: Have You Done This in Your Blogger Blog Site? First Step: In choose platform option, scroll down and you will see another option like below and click on. Second Step: Now copy the following code. Customize: Replace PAGE_URL with your website or blog and https://compromathdemo.disqus.com/embed.js with your Disqus URL. Third Step:Add the follow script before </body> tag. 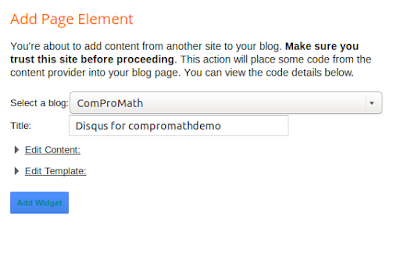 Customize https://compromathdemo.disqus.com/count.js with your Disqus URL and save your template or theme. To get help more please comment below. Support from Disqus here. Disqus Help.